Vita 57.x provides a single mechanical & electrical standard for I/O mezzanine modules. This standard introduces a methodology that shall allow the front panel IO of IEEE 1101 form factor cards to be configured via FPGA based mezzanine boards. Vita 57 modules have fixed locations for serial/parallel I/Os, clocks, Jtag signals, VCC, and GND. 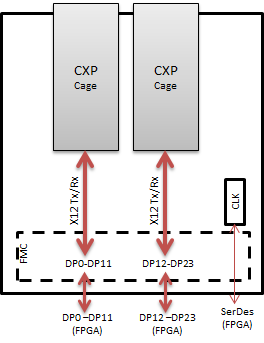 This FMC Module provides access to two CXP ports for 12x10G , 12x12.5G, or 10x10G applications through 12 Tx/Rx lines from FPGA carrier boards. The module is supported by an onboard programmable oscillator with default start up frequency of 156.25Mhz.